Nestled between the beautiful Pacific Ocean and Gold Coast Broadwater, Palazzo Versace offers spectacular architecture and bespoke furnishings. Guests enjoy free WiFi access. This fashion-brand hotel has an Aurora Spa Retreat, a 24-hour fitness and wellbeing centre, a private marina, a Versace Boutique and event facilities. There are also swimming pools and a spa pool. Guests can dine at 3 award winning restaurants, Vie Bar and Restaurant serving contemporary Australian flavours, II Barocco Restaurant, serving a fresh and lavish seafood buffet and Vanitas. Palazzo Versace also boasts 2 chic bars including Le Jardin, where you can try the latest cocktail, enjoy a high tea or relax with a coffee in the beautiful lobby. All rooms and suites are decorated with Versace furnishings, luxurious fabrics and floor to ceiling windows. They also include private balconies, a cable TV, DVD player and bathrooms with spa baths. The hotel has private valet parking and offers an airport transfer shuttle on request. 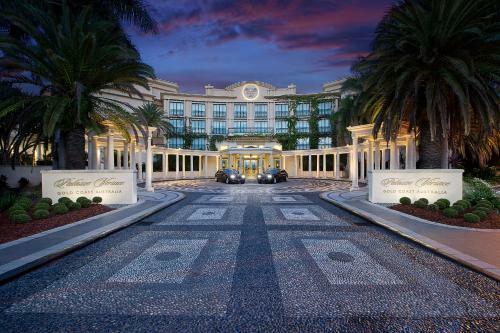 Versace Palazzo is less than 10 minutes’ walk from Marina Mirage and Sea World.